RESQ Charitable Trust - Beauty isn't about having a pretty face! Earlier this month we received a late night report of a cow with a broken jaw being pelted at with stones. Our team immediately rushed to the location only to encounter an unimaginable situation.A young cow was being bullied by the people in her surroundings for the way she looked. Being a timid girl, she just walked away and harmed the inhumane people in no way! 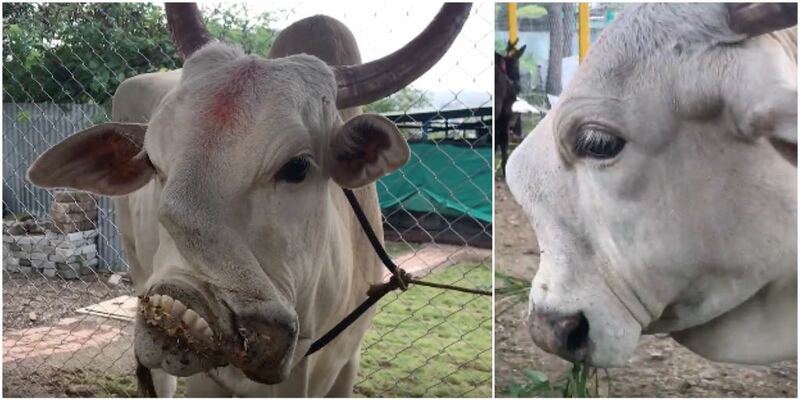 Despite the fact that cows are worshipped in our country, Veera was in an atrocious condition. We realised that the streets of Pune were no longer safe for her so we brought her to the RESQ Centre and thus, under our care. Her name is Veera which stands for being brave, for she is one of the bravest souls to have survived by herself for all these years despite the odds being against her! Our doctors suspect that she might be suffering from either a birth deformity or an old fracture that healed incorrectly. Veera’s condition makes breathing and chewing food a little difficult for her which is why our team believes that it is best if she stays at our centre under constant medical care and observation. We are providing her with special food to ensure she gets the required nutrition and has no trouble eating or digesting. However, she is in need of a home, that will treat her as their own and meet her special needs. Currently a resident of our large animal unit along with several other animals including horses, donkeys, bulls, cows, calfs, goats and a sheep as well, Veera had already been accepted as one of their own in no time. This makes us believe that no matter the size, shape or colour, they are all one, united at RESQCT. One of the most adorable friendships at our centre, Bulbul and Veera have formed a special bond. We see them often grazing together and they are practically inseparable. Veera is now a much healthier and happier animal. Everyone is welcomed to our centre to give Veera a scratch on her head, Oh how she loves those!